Most of the year it is pretty easy to keep your horse drinking to stay healthy & hydrated, just provide clean water. But getting a horse to drink the approximate 10 gallons of water they need per day, during cold weather, can be quite a challenge at times. Not only is clean water important in winter, now you have to factor in freezing water, and even the lack of interest in water sometimes due to the horse being cold. Most owners feed more forage during winter, to keep their horse warm (digestion aids in keeping a horse warm). Due to this, without proper water intake, you could risk colic or other digestive issues. The water helps keep a horse’s digestive tract moving and healthy, as well as keep the horse hydrated. Make them thirsty. No matter the temperature of the water in winter months, some horses just don’t drink as much, and they need a helping hand. Make sure your horse has a salt lick & mineral lick, you can also feed your horse electrolytes if you are concerned. 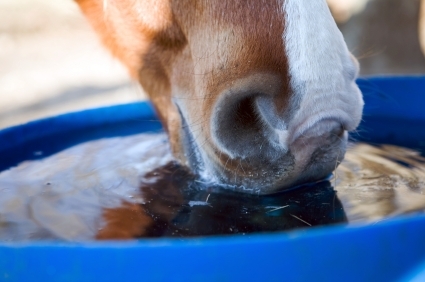 The salt typically triggers your horse’s thirst and will get them drinking. Warm Mash. Something to help promote more water intake is feeding your regular grain ration as a warm mash, or getting hay cubes and soaking them in warm water. While this amount of water isn’t enough to replace proper water intake, it will at least help some. The soupier you make it, the better. (Be prepared to get covered in appreciative mash kisses). Hopefully you can start to use these tips in your horse’s care and keep your horse healthy and hydrated during cold weather. If you have any tips, we’d love to hear them, be sure to comment below! And as always, with any concerns about your horse, your vet should be your number 1 resource!